I’ve written about how much I love daily deal sites like Groupon and LivingSocial; given their success, you probably do to. However, I have one rule about this sites that I want to share, and I want your opinion about it. I think it’s a rule worth following, but I understand if others have different points of view. My Groupon Rule: Don’t buy daily deals from restaurants and stores that you already like and believe in. Instead, use them as a reminder to give those places your business. 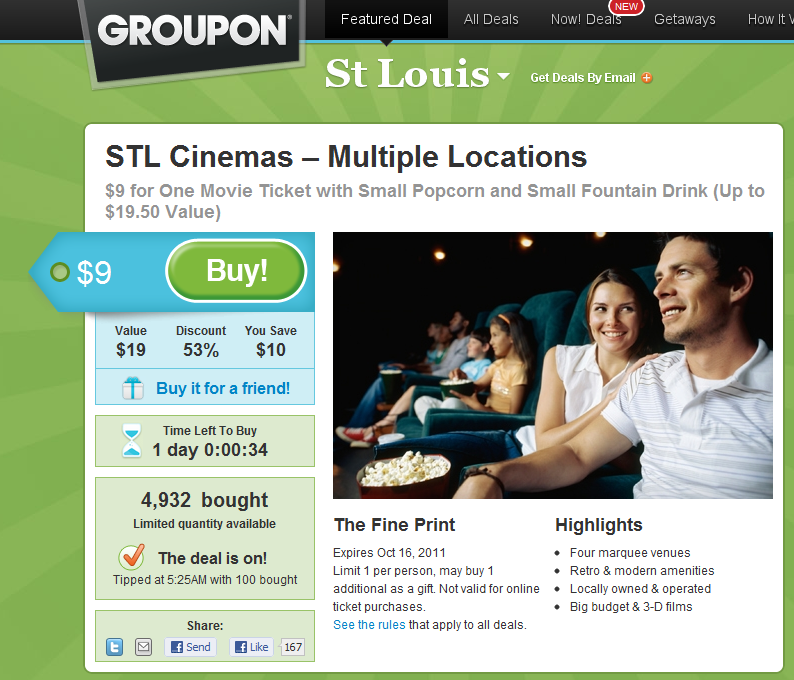 I realized that I have this ruled today when I saw today’s Groupon in St. Louis (see photo). St. Louis Cinemas is an awesome, local, independent chain of movie theaters. I’ve been to their theaters at least 20 times this year. Their popcorn is delicious. Thus this daily deal would have made sense for me to get, right? So I’d challenge you to think about this when you spot a Groupon for your favorite restaurant. And maybe you could justify it if you go there as often as I go to the movies. But if you haven’t been to that restaurant for a while, go there and give them your money. If you already know you love the place, you’re getting something great in return. This entry was posted on Wednesday, August 17th, 2011 at 12:24 am	and is filed under restaurants, St. Louis and tagged with St. Louis. You can follow any responses to this entry through the RSS 2.0 feed. 1) I am not a manager, owner or investor in this retailer. I am a consumer. How you choose to run your business is up to you. If that includes a marketing campaign aimed at bringing in new people using Groupon, that’s your call (as is how you set your prices, your stock, your inventory, your decor your location, etc). But as a consumer I will not penalize myself by not taking advantge of an offer any retailer has made me. 2) New first visitors are not the only types of business that retailers are targeting with Groupon. Increased frequency of trips, and increased qty of items sold (or dollars of each sale) are business strategies that major retailers use on a regular basis, that will translate to smaller retailers as well. So if St. Louis Cinemas offers a groupon for a free Popcorn with each ticket, they’re trying to get you hooked on how good their popcorn is. If I already get it sometimes, maybe I’ll get it more frequently. Or maybe I’ll decide to go to St. Louis Cinemas BECAUSE of their popcorn in the future. Even though I’ve already been to St. Louis Cinemas before, now they have increased their total busines sbased on this incentive to a returning customer. In any case, I think you have a potential do be doing a disservice to yourself by not taking advantage of any offer a retailer makes. All business interactions are relationships. By standing on principle, you may negate the business’s opprotunity to be nice to you. Some good dissenting thoughts here. And it’s true that businesses can specify that the Groupons are only for first-time customers (but that’s tough to enforce, and few businesses do it). What I’m talking about isn’t so much about consumerism–it’s about doing the right thing. I want to support the businesses I already love with my money, not Groupon (I also want to support Groupon, but not for businesses I already love). I did mention that Groupons aren’t only good for new customers–they’re also good for customers that haven’t been to the business in a while. But you make a good point about a third target group–customers who haven’t tried all of a the goods and services a business has to offer. However, in the St. Louis Cinemas example, I’ll stick with my rule: I often get their popcorn because it’s good popcorn. So I want to continue to give them money–not Groupon–so they can continue to give me good popcorn. It would be interesting if in the future, Groupon could delineate between new/infrequent customers and loyal customers. So for $9 a new/infrequent customer would get a movie, popcorn, and drink. But a customer that has previously bought a St. Louis Cinemas ticket or has checked in there on FourSquare could get a new special bonus. There is a company called LevelUp doing something like this, but slightly different. And in a way, FourSquare is doing that on their own. But if it were consolidated into Groupon, St. Louis Cinemas wouldn’t have 2,000 people sign up for something they were going to pay full price for.